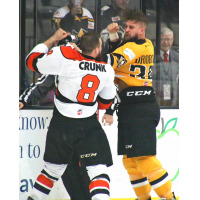 WHEELING, WV - The Wheeling Nailers had a difficult start to Friday night's game, but put forth a strong rally against the Fort Wayne Komets at WesBanco Arena. Fort Wayne jumped out to a 4-0 lead in the first period, before ultimately holding on for a 5-4 road win. Cam Brown led Wheeling's offensive attack with one goal and two assists. The first period was not a good one for the home team, as the Komets charged out of the gates with a 4-0 lead. Alexander Kuqali forced a turnover in center ice, allowing Jake Kamrass to fly in on the right side of the offensive zone. He slid a pass to Justin Kea in the slot for the opening marker. 1:15 later, Fort Wayne struck again. J.C. Campagna wound his way through the high slot, then roofed a shot from the left circle. The other two goals came during the final five minutes of the frame, as Kamrass and Campagna dented the twine. The Nailers had a strong response in the middle stanza, as they closed the gap down to as low as one, before the Komets took a 5-3 lead into the intermission. Zac Lynch got the first goal of the night for Wheeling, while his team was playing shorthanded. Cam Brown won a battle behind the net, then proceeded to feed Lynch, who potted his second chance. The next tally went to the power play, as Michael Phillips helped win the puck to Alex Rauter, who snapped in a shot from the right circle. 61 seconds after that, Nick Saracino netted an even strength goal, wrapping in a shot after starting in the trapezoid. Phelix Martineau put Fort Wayne back ahead by two on a rebound goal 22 seconds after Saracino's strike. Wheeling nearly completed its comeback in the third period, as Cam Brown trimmed the deficit to one with 5:30 remaining. Michael Phillips rang a shot off the left post, and Brown cleaned up the rebound. Unfortunately, a tying goal wasn't in the cards, as the Komets escaped with the 5-4 win. Zachary Fucale got the victory in goal for Fort Wayne, making 31 saves on 35 shots. Jordan Ruby stopped 16 of the 17 shots he faced for the Nailers, but suffered the loss in relief of Danny Tirone, who allowed four goals on 11 shots in the first period. The Nailers will travel to Toledo for a 7:15 game against the Walleye on Saturday, before returning to WesBanco Arena on Sunday, where they will play host to the Indy Fuel at 3:05. Sunday is a Family Funday, featuring a Post Game Skate with the Team. The next big promotional game is NailerMania on December 15th, starring WWE Hall of Famer Mick Foley. Teddy Bear Toss and Ugly Sweater Night will also be part of that fun-filled game. Family Four Packs are available for NailerMania, thanks to WTRF - for $60, fans get four tickets, four hats, and four McDonald's Meal Vouchers. 2018 Holiday Packages are now available as well. The Wheeling Nailers, considered one of the top things to do in Wheeling, West Virginia, provide affordable family entertainment for fans throughout the Ohio Valley. For information on season tickets, group tickets, flex plans, and more, call (304) 234-GOAL.